*$100 Security Deposit refundable on return of scooter in good order. Cost of spare parts will be deducted from security deposit should damage to scooter occur. Whilst contemplating the start-up of Scooters on Straddie, we looked at what was really missing on the Island. Wasn’t too hard to figure out that it was ACCESS! Access to Brown Lake, Straddie Golf Club, Myora Springs, Amity Point & Rufus King Fresh Seafood… and we knew that getting around Point Lookout was either long walks… or long waits for buses to get from one place to the next! So, SCOOTERS on STRADDIE was born. After months of preparation still ongoing we are very confident that our customers will not only have a great and fun experience in riding a scooter and enjoying the freedom… but they can actually see the Island. North Stradbroke has a lot on offer and without the expense of bringing a vehicle over… you can shuffle around the Island – at YOUR pace! For those of you wanting to start your Sat/Sun with some calm before getting stuck into the day. Keep a look out for the roadside signs and come join in the fun. 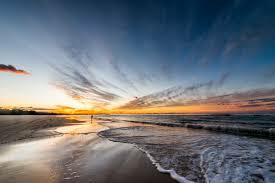 Get yourself down to one of the beaches to take in the breathtaking sunrises (and sunsets). 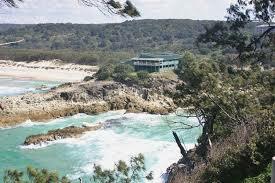 Take in the serenity of Straddie and promise yourself that you’ll come back again! 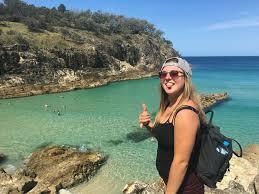 There is no way of getting to Brown Lake without a car/4WD/Taxi or by hiring a Scooter from SCOOTERS on STRADDIE. This beautiful Tea-tree water Lake is warmish & safe and has BBQs, toilets etc and is great for a visit on a nice warm day! Jump on your Scooter and head out on Alfred Martin Way in Dunwich for a few holes of GOLF! The boys there can hire you a buggy, clubs and there are balls for sale! The views from the deck stretch as far as the Glasshouse Mountains Have a beer and something to eat after your game and then head off to your next adventure! Head off to Amity Point to try to spend some time with some Dolphins. These Dolphins have been helping the Indigenous people of the Island fish, for many thousands of years. You may get lucky in the afternoon and have the chance to swim with them by the jetty! Drop into Seashells whilst in Amity and check out the Menu, or simply while away some time having a coffee and planning your NEXT stop! It’s Licensed, has beautiful food and a lovely friendly atmosphere! Take your scooter to the entrance of Home Beach… get out the rod and go try your luck at the beach. Just never know what you might come up with! There are plenty of good fishing spots at Flinders and Home Beach! Park up your Scooter and head into the Straddie Hotel, for great service and even better food! Restaurant closes at 2.30pm so get in early. Enjoy the fabulous views from the dining deck! Have a punt, or just relax! Please drink responsibly! Bring your own picnic over… our Scooters have luggage racks… and head off to somewhere magical for your lunch! You now have access to anywhere you like (except on Sand) ! The day is yours to fill with fun things to do! Get a Scooter from SCOOTERS on STRADDIE! Enjoy some of the finest food on the island, takeaway or dine in. 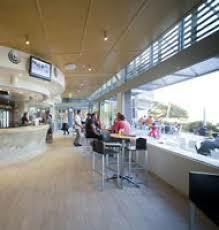 There are plenty of top class restaurants and take away places to suit all tastes. If nothing takes your fancy… try the Bowls Club at Point Lookout, or just get a Burger from The Roadhouse and head off somewhere to enjoy it! Jump on you Scooter and head up to the Gorge, on Kennedy Drive, just before the PL Surf Life Saving Club. Take the 1.5 hr North Gorge Walk and maybe catch glimpses of Dolphins surfing the waves… or Manta Rays just lolling around in the beautiful water! You won’t regret this walk… but remember your camera! A typical shot from the Gorge Walk. Beautiful clear water and nature at its very best! Amazing! Looking back at the Surf Life Saving Clubhouse and Gorge from the Gorge walk! Try your luck at Sandboarding some of Qld’s biggest Dunes. 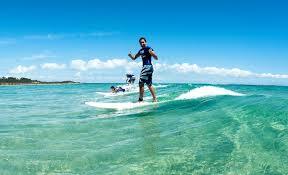 Bring your own board or hire one from the local tourist agencies on the Island. A Scooter from SCOOTERS on STRADDIE is simply the best way to find the right location for Whale Watching during the season. They can be seen from Point Lookout… and sometimes even Amity Point. Don’t be restricted by transport timetables! Get there when YOU want to get there! Plenty of waves to be caught at Straddie, for all levels of surfing! Bring your board over on the Water Taxi and Hire a Scooter from SCOOTERS ON STRADDIE. We’ll pick you up from either the Water Taxi or The Flyer and get you started on a fun day out! We have Surfboard racks to take all sizes and shapes… for only $5 per day when you hire a scooter. That way you can get to any beach, spend whatever time you want before moving to the next. No waiting for buses or walking! Our SCOOTERS ON STRADDIE BUS will pick you up at the Water Taxi and the Straddie FLYER from the 7.55am sailing from Cleveland – arriving in Dunwich at 8.25am. Our LAST drop-off at the Water Taxi & Straddie Flyer will be at 4.55pm… providing your Scooter Return goes to plan and there are no issues… however you can bring them back at any time in between and we’ll take you to the next available boat! We will also collect people from Point Lookout and Amity Point once per day between 8.50am and 9.00am … and take you to Dunwich, then return you home when your Hire is completed. How much easier could it be? Get a LIFE! Get AROUND! SEA THE ISLAND!